Are you in the middle of upgrading your kitchen? Perhaps it’s time for a new look for that kitchen backsplash. This can be especially true if you’ve just moved into a new home and you want to make the kitchen feel personal and make it feel like your own. A great way to update your kitchen backsplash would be to upcycle one. Before you get started, you may want to check out our recent blog post Making an Old Kitchen Look New. Upcycling is using something that otherwise would be thrown away. Upcycling can be a fun and crafty way of repurposing objects you already have in your home or at your disposal. A kitchen backsplash is the space on the wall above the kitchen counter. The backsplash is commonly constructed out of the same material as the kitchen counters. Popular backsplash materials include marble, stainless steel, tile and tile mosaics. Note that the portion of the backsplash above the range can become a big focal point in the kitchen design. Do not neglect the chance to personalize this part of your kitchen! Upcycling a backsplash is a great and fun way to save money while remodeling your kitchen. Upcycling involves recycling everyday items into unique and personal projects. An upcycled backsplash will be more personal and will give your kitchen a distinct look that you won’t see anywhere else. If you’re an experienced DIYer, then upcycling a backsplash is the right project for you. This upcycling project by Lilybee on Curbly is the perfect project to spruce up a rental kitchen. Lilybee put this together with placemats she found at the dollar store and some thumb tacks. She lined up the placemats in a repeating pattern she was happy with and tacked them up. This is faster than installing tile, it’s less messy than tiling and it’s unbelievable how little this project costs. Plus, the placemats can be taken down and washed by hand. Are you a lover of craft beer and/or vintage soda? You can show off your bottle cap collection with a special backsplash project. Once you have enough bottle caps to create an entire backsplash, cover the backsplash in tile mastic. Place bottle caps on the backsplash in the pattern of your choosing. After it dries, grout the backsplash the same way you would if you were tiling it. This backsplash is now a personal mosaic of your favorite drinks. Pennies may not be what first comes to mind when you’re redoing your backsplash, but they do create an amazing effect when placed into a pattern on the wall. It will take about 6,000 pennies to cover the average kitchen backsplash. The light reflects off of the pennies and creates a lovely, copper glow. You can also arrange the pennies in different patterns to create different aesthetics. First, shine the pennies with tarnish remover. Rinse them and allow them to dry. Purchase clear mosaic mounting sheets sized to your backsplash. Arrange the pennies on the mounting sheet. Lay tile mastic on the backsplash and apply the mounting sheets. Remove the sheets and grout the pennies after the mastic dries. 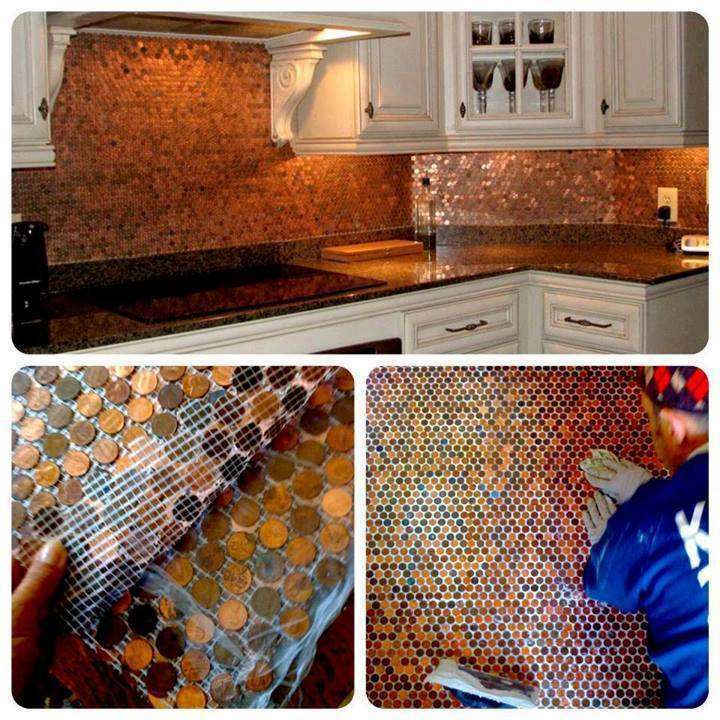 Wipe off any extra grout and shine the pennies. Seal the backsplash, and enjoy the new addition to your kitchen décor. You can repurpose some maps or some vintage posters with this backsplash project from the DIY Network. This project is actually a lot easier than it looks. You will first create a template of your backsplash using paper and luan panel. The maps are cut to fit the luan panel with one extra inch around and are mounted with spray glue. The luan panel is placed on the backsplash and secured with drywall screws. Make sure the drywall screws are attached to studs in the wall. You will now have a fun and unique kitchen backsplash. Perhaps it will inspire you to travel and think of far off destinations as you prepare your meals at home. You could repurpose this DIY project to create a backsplash with a decoupage design or create a collage out of comic book covers, gift cards, movie posters, vintage wine labels or whatever your heart desires. Repurpose wood to give it new life and to make your kitchen look fabulous. Dana and Ryan of the blog Circa Dee created a beautiful, rustic backsplash out of old shipping pallet wood. To create this kitchen backsplash look, they took apart the pallet and cut it into 18 inch pieces. Dana then washed the wood, and Ryan secured it to the backsplash using liquid nails. They made sure to place the wood pieces into a pleasing pattern by alternating the light and dark pieces across the backsplash. Dana and Ryan obtained this pallet wood for free! If you try this project, just be sure to choose wood that has been treated to keep your kitchen a safe place, especially if food may be touching it while you are cooking. You can also treat and seal the wood if you do a lot of frying in your kitchen. The creation of the kitchen backsplash below was documented by Jill Fritz on the blog Create.Craft.Love. This is the perfect backsplash for DIYers and wine lovers. 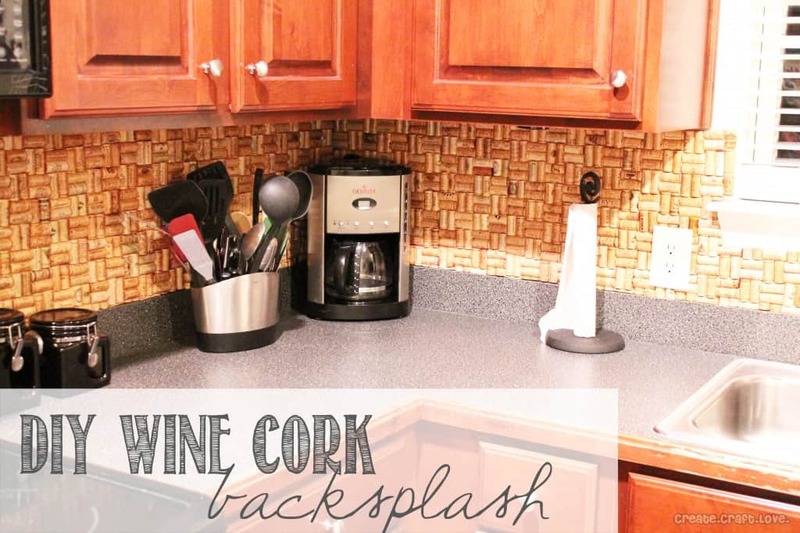 Jill estimates that 800 wine corks were used in this backsplash in her sister’s small kitchen. Her sister collected wine corks from family, friends and local restaurants. They also created a formula to estimate how many wine corks will be needed for your backsplash. Alternatively, you could just decorate the portion of your backsplash above the range with wine corks for a design focal point in your kitchen. Jill’s family used a scroll saw to cut each wine cork in half. The wine corks were then placed in a basket weave pattern on top of a plywood template that was sized to the backsplash. Remember to leave holes for your kitchen outlets. They secured the wine corks using contact cement and hid the edges of the plywood by notching the wine corks on the border of the template. They also sealed the wine corks with a clear spray sealant. Lastly, they used caulk to make the wine cork backsplash water-tight. -Cover the backsplash in picture frames. -Create a backsplash out of rocks and stones from your adventures and walks on the beach. -Use mirrors to cover the backsplash in a fun, reflective surface. -Place a family memento above the range on the backsplash. -Update the look of your backsplash inexpensively by decorating the existing tile. You can paint the tile or buy tile decals for decorating it. -Purchase removable wallpaper and cover your backsplash with it. -Create a template and lay down some fabric for a fun backsplash design. -Paint your backsplash with chalkboard paint. -Mount a magnetic sheet of metal for a backsplash and you can post recipes and lists on the backsplash. You could even store magnetic bottles of spices or other kitchen equipment on your magnetic backsplash. Upcycled backsplashes can be fun DIY projects that are inexpensive and result in a beautiful and personalized backsplash for your family to enjoy for years to come. If you have successfully upcycled your backsplash, please share your photos! This entry was posted in Home Improvement, Kitchen Design, Kitchen DIY, Range Hoods and tagged backsplash, diy, DIY backsplash, kitchen, kitchen backsplash, kitchen diy, upcycle, upcycled backsplashes on January 30, 2015 by editor. 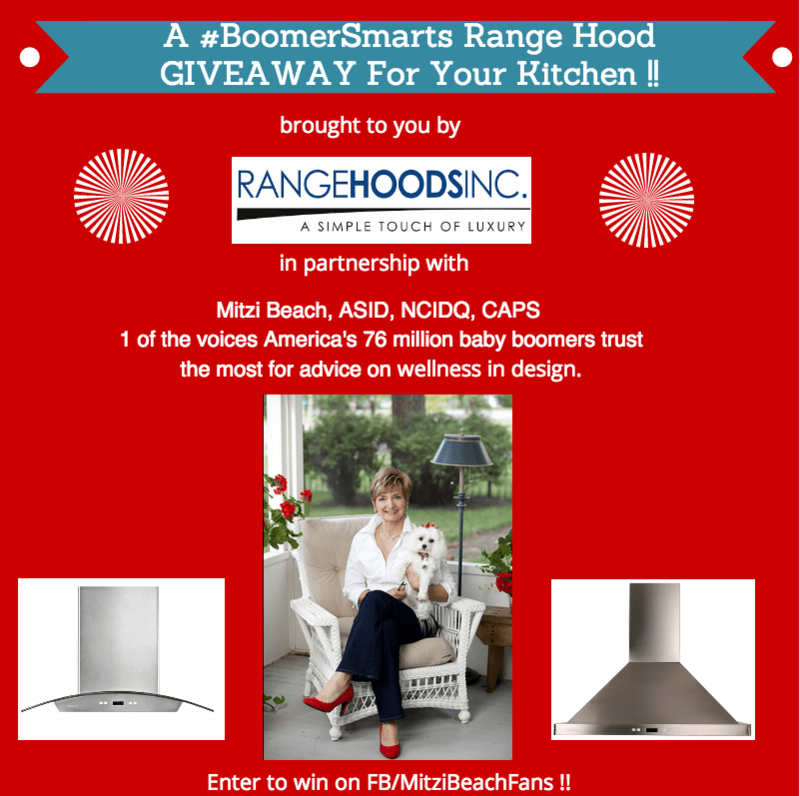 Range Hoods Inc sponsored a #BoomerSmarts #HealthyKitchen Giveaway with Mitzi Beach on her Facebook page. Mitzi Beach, ASID, NCIDQ, CAPS, is an interior designer and expert in wellness in design and aging in place. We are excited and happy to announce the winner of the giveaway: John Wright of Tennessee. John has a choice between a Cavaliere-Euro SV218D Wall Mount Range Hood or a Cavaliere-Euro SV218B2 Wall Mount Range Hood in 30” or 36” wide, provided by Range Hoods Inc. Many people entered the giveaway and posted a description of their ideal healthy kitchen on Mitzi’s Facebook. We were touched by reading the descriptions of everyone’s dream kitchens. Ultimately, Mitzi chose to gift the range hood to John Wright, who entered the giveaway on behalf of his church in Smithville, TN. 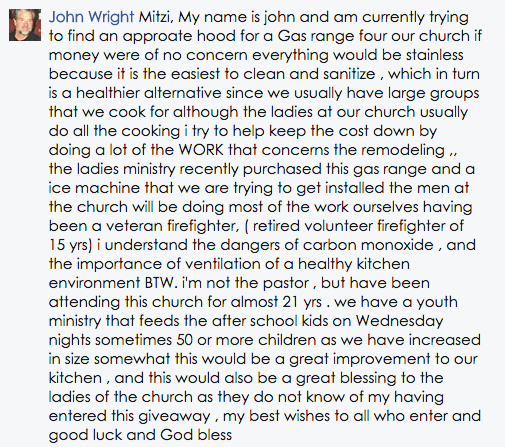 Mitzi chose John’s #healthykitchen description because the range hood can create a healthy space for the most people at once in the church kitchen, where meals are cooked for children after school. John’s ideal kitchen description included a stainless steel range hood, which is easy to clean, that ventilates the kitchen of dangers like carbon monoxide. As a veteran firefighter, John was concerned about the air ventilation in the church’s kitchen. He also wanted a range hood that ventilates the kitchen and is pleasing to the eye at the same time. John will be surprising the church with this free range hood. Read more about John’s story below. Congratulations, John. We hope your church enjoys the range hood for years to come. We also hope that John will post photos of the range hood in the future to Mitzi’s Facebook page, which we look forward to sharing. Thank you, Mitzi Beach, for hosting this wonderful #healthykitchen giveaway. We are proud to be a sponsor and to have partnered with you on this. 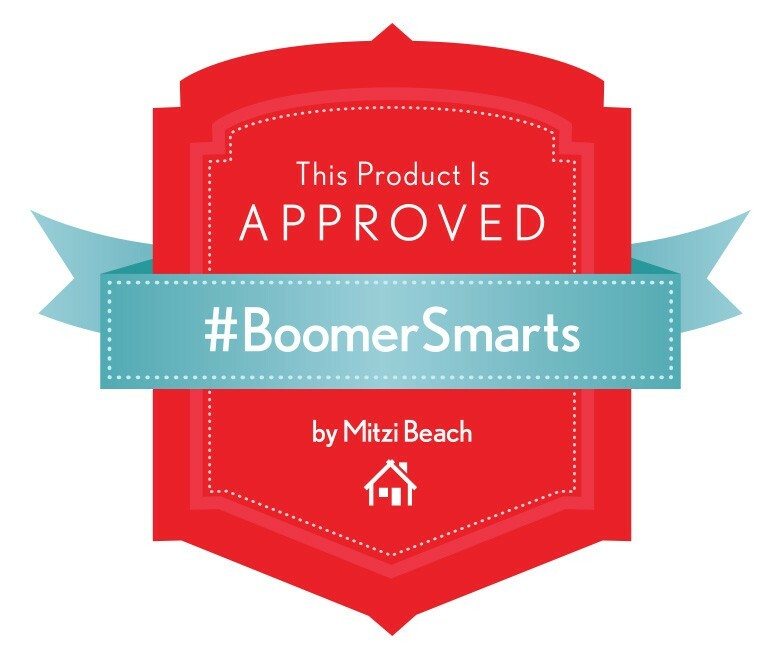 Mitzi has approved range hoods from Range Hoods Inc as #BoomerSmarts for healthy homes! This entry was posted in Cooking, Cooking with Range Hoods, Giveaway, Home Improvement, Range Hoods, Wall Mount Range Hoods and tagged Baby Boomers, best buys in range hoods, Cavaliere range hoods, contest, giveaway, healthy homes, healthy kitchens, interior designer, Mitzi Beach, products for healthy kitchens, range hoods inc, stainless steel range hoods on January 27, 2015 by editor. Watch out, Superman! Otherwise you might get your cape stuck in a stainless steel kitchen range hood. This entry was posted in Home Improvement, Humor, Range Hoods and tagged funny, home improvement, humor, kitchen, kitchen remodel, range hood, range hoods inc, Superman on January 16, 2015 by editor. Do you think Peter Jackson included a range hood in Bilbo’s hobbit hole? We think maybe he should have with all of the eating that hobbits do. This entry was posted in Cooking with Range Hoods, Humor, Range Hoods and tagged cooking, funny, humor, kitchen, kitchen appliances, range hood, range hoods inc, The Hobbit, The Hobbit: The Battle of the Five Armies on January 13, 2015 by editor. 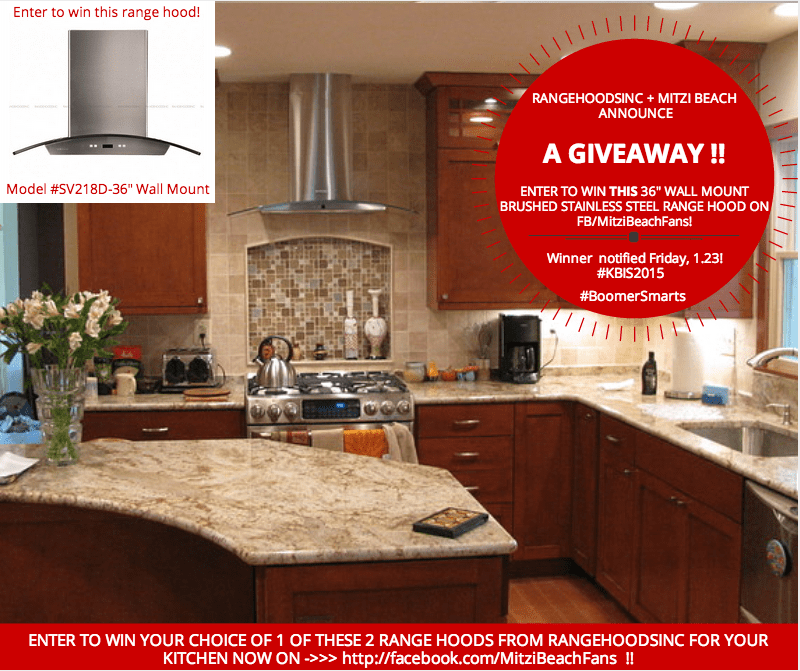 Range Hoods Inc is excited and proud to announce its involvement in the 2015 #BoomerSmarts Healthy Kitchen Giveaway from MitziBeach.com. Mitzi Beach, ASID, NCIDQ, CAPS is an interior designer who educates, writes and speaks about wellness in design. Mitzi is an aging in place specialist and is well versed in universal design for Baby Boomers. Mitzi will also be attending Modenus’ #BlogTourVegas to the National Kitchen and Bath Association Show, beginning on January 20, 2015 in Las Vegas Nevada. The winner of the #BoomerSmarts Healthy Kitchen Giveaway with Range Hoods Inc will receive a stainless steel Cavaliere range hood. The winner will be able to choose between the two following models, in either a 30” or 36” width, for their kitchen remodel or upgrade. Click here to learn more about the model above. The winner will be chosen on Friday, January 23rd, 2015 and will be announced on both Range Hood Inc’s blog and Mitzi’s blog on Monday, January 26. Entering the giveaway is easy. Be sure to enter before it closes on January 22, 2015 at 12 am ET. To enter, please leave a comment at http://facebook.com/MitziBeachFans on the update about the giveaway. Your comment should be about your Dream Healthy Kitchen. Let Mitzi know what it would look like if money were no object. Please explain how much having a range hood would help you keep your dream kitchen and home cleaner by ventilating grease, odors and carbon monoxide from your home. On Thursday, January 22, 2015, at 12 am ET, the giveaway will close and the winner with the best description will be chosen and notified via a Facebook message. Check your Facebook messages on Friday, January 23rd and look out for the announcement blog on Monday, January 26th. Is a Kitchen Range Hood Necessary? 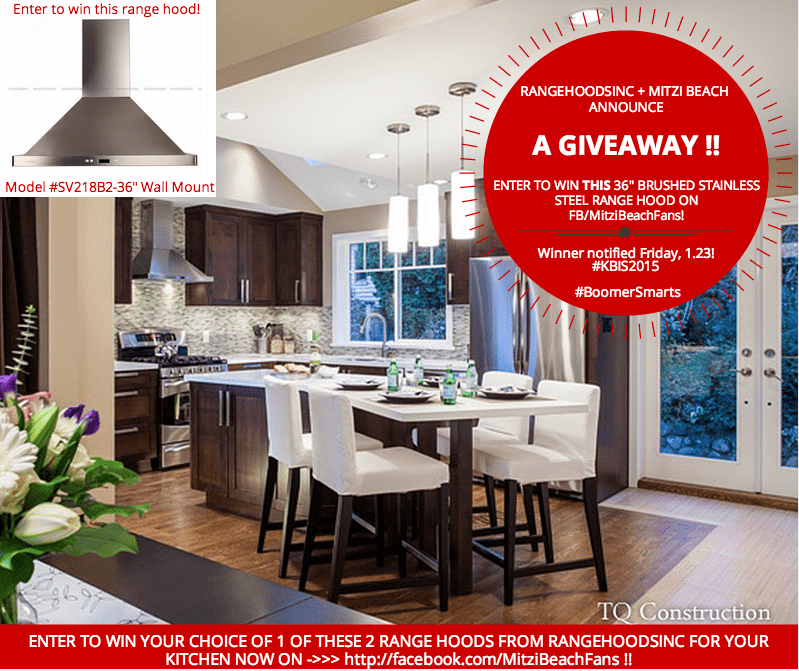 This entry was posted in Cleaning the Kitchen, Cooking with Range Hoods, Giveaway, Home Improvement, Kitchen Design, Range Hoods and tagged #BlogTourVegas, #KBIS2015, Baby Boomers, BoomerSmarts, giveaway, kitchen, Kitchen Design for Baby Boomers, Kitchen Giveaway, Mitzi Beach, Mitzi Beach Interiors, range hood, Range Hood Options, range hoods, range hoods inc, rangehoodsinc, stainless steel range hoods, venting a kitchen, wellness in design on January 5, 2015 by editor. Need help with keeping your New Year’s resolutions? Range Hoods Inc is available all year with a wide inventory of kitchen range hoods for your home remodel. Make this year the year you make the change! This entry was posted in Holiday, Home Improvement, Humor, Range Hoods and tagged home improvement, kitchen, New Year's resolutions, New Years, range hood, range hoods inc on January 2, 2015 by editor.